This entry was posted on November 8, 2018 by Jessica Anderson. Now that Halloween is all wrapped up, it's time to look forward to the next big holiday, THANKSGIVING! And when thinking about Thanksgiving, you can't help but think about FOOTBALL! They go together and you can’t have one without the other IMO! If football is a Thanksgiving tradition in your family, you can enjoy it two ways: Watching or Playing. Watching: Gather with family and friends, feeling grateful for all of your blessings, then eat until your pants won’t button. Then after the feast, pass out on the couch watching the epic NFL football battles on TV. Let the tryptophan do it’s magic! Playing: Actually move your body with a walk or activity. Participate in a local Turkey Trot, such as the one in my community of Issaquah, WA. 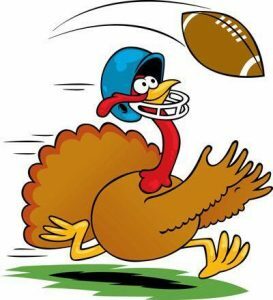 Or gather your family, friends, neighbors or co-workers to host a Turkey Bowl! Play a competitive game of tackle or touch football on Thanksgiving Day or over the long Thanksgiving weekend to counteract that delicious gluttonous Thanksgiving meal. So how do you put together a Turkey Bowl game? Here are some ideas to think about when planning. Party: Most people keep their Turkey Bowl competition low-key, as the whole Thanksgiving/Black Friday/Holiday kick off is party enough for that weekend each year. But if you decide to create a party a great website to get ideas for invitations, decorations, and themes is Party411. Food: Play BEFORE eating Thanksgiving dinner – the exercise will work up an appetite, earlier in the day means light and warmer temperatures, and your stomach won’t be totally stuffed, making your players sleepy blobs! However DO be sure to bring plenty of water to keep your “athletes” well hydrated. Location: Local schools, a nearby large field, or a neighborhood park all make great locations for your football game. Make sure to know the boundaries of the “field” so there aren’t arguments later about what’s in bounds and what’s out. The Ultimate Turkey Bowl competition, white meat vs. dark meat! - Our exclusive Turkey Bowl Championship Trophy. 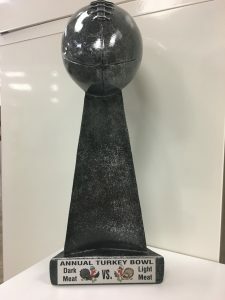 One past customer had turkeys printed on the plate of their football trophy, it was super cute! If part of your Thanksgiving tradition already includes a turkey bowl, tell us about it in the comment! Or if you want to start a turkey bowl, give it a try! And don’t forget the turkey trophy! Happy Thanksgiving, we have so much to be grateful for! Editor's Note: This post was originally published November 2017, It has been updated for content.